Gwynnie Bee is a clothing rental subscription service that caters to women between the sizes of 0-32. Gwynnie Bee allows you to select items you like and they are put in a virtual closet. The chosen items sent to you are at random, but you can select priority pieces to be sent to you first. I just started using the service a couple months ago and can say I always have a lot of fun with this box! Gwynnie Bee is a clothing rental service, but they also have a marketplace on their site where you can buy strongly discounted used rental pieces and brand new accessories, underwear, and work out gear as well! The Cost: The cost depends on how many items you would like to have out at a time. The Products: Women’s clothing rental, sizes 0-32. This review is of the one item at a time for three items that I received between October 6th through the 22nd. 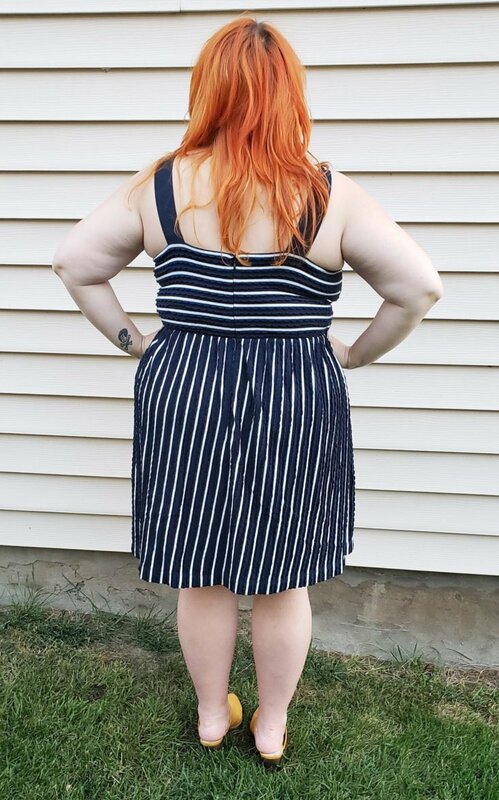 I was excited to try this dress out since it is from LOFT’s brand new plus line. About time, am I right? Though fall is here and this is a sleeveless dress, no fear—summer dresses can be worn in fall and winter, my fellow bodacious babes! The day I tried this lovely dress on, it was exceptionally warm out. I was able to wear it alone or pair it with my go-to faux leather biker jacket and mustard yellow mules from Old Navy for a pop of color! One can easily wear this summer dress in cooler months with a jacket, tights, thick circle scarf, and booties. You also can wear pieces layered underneath like a long-sleeved, fitted top or a floral button down for some fantastic pattern clashing. Just make sure to top the look off with a cozy, oversized cardigan and booties. You are Fall ready! I saw this dress and it immediately made me think of a top/skirt combo my friend Jamie has from a brand called Maree Por Toi that has a similar plaid print. Jamie rocked her ensemble with sneakers and effortlessly looked comfortable and chic. This dress has such a classic feel, but the modern mermaid ruffle is such a modern touch. The fabric is surprisingly soft and has ample stretch. I opted to style this piece with my favorite Wild Fable shoes, cateye glasses, and a necklace from my most recent Jewelry Subscription box. This dress is perfect for the office, but you can wear it out after for a nightcap with heels, a body-hugging biker jacket, and big hoop earrings for some fierceness! Guys, this dress was the real underdog of my October Gwynnie Bee selections. I was not expecting to like it, but I absolutely fell in love! I was hook line and sinker and with a $5 coupon, I couldn’t say no to it at $24! The dress has great stretch which allows it to perfectly fit the curves of my body. If you are new to my reviews, I am a sucker for vintage and retro styles, so these bell sleeves are everything! I am surprised I loved the floral print because it has so much fuschia/pink in it, but it somehow works! I styled the dress with my favorite double buckle western style belt and cowboy booties from Target. I was definitely channeling Stevie Nicks going to a rodeo realness, mamas! The dress is not up for rental, but you too can buy it at Gwynnie Bee’s outlet store if you love this piece as much as I do! This was another item I underestimated, but I was wowed upon unboxing this retro style dress! First of all, it reminds me of something Miss Yvonne from Pee Wee’s Playhouse would wear, so of course, I was immediately won over! Secondly, the fabric is made of a structured, yet stretchy scuba-like material. I was fearful this dress would be made of an easily wrinkled cotton sundress material, so I was pleasantly surprised! Third, holy smokes, this psychedelic floral print is what dreams are made of, I tell ya! I returned this dress, but I hope to grab it when it hits the outlets so I can wear it next year to all the summer weddings and ice cream socials! The Verdict: I mentioned lately how much I love Gwynnie Bee! I know I sound like a broken record, but I truly appreciate this service and can’t recommend it enough. I tried out four dresses this month and found a dreamy dress that I may have never tried on, let alone bought otherwise! I enjoy getting to try different trends and brands I might have overlooked previously. I also like that it is a rental service too because let’s be real here: sometimes you simply want to wear a piece once or twice. With Gwynnie Bee, you can wear an item a few times and return it. No more guilt, while rifling through your closet and spying that dress you wore maybe four times rotting away on a hanger, my friends! I also love the fact that Gwynnie Bee offers free shipping, returns, and dry cleaning. I can’t foresee myself tiring of Gwynnie Bee anytime soon. Can you still get this box if you sign up today? Yes! Three of the four pieces are available to rent or purchase at Gwynnie Bee. One dress is only available for purchase in the Gwynnie Bee Outlet. Coupon – No coupon required! Just use this link to sign up and get your first month FREE! Value Breakdown: Gwynnie Bee’s costs range depending on your subscription and how many items you are sent at a time. I have the $95 three item at a time plan. This includes free shipping and returns. I can get as many pieces as I like monthly, as long as I return each item first. I got four items this month, but I could get several pieces sent to me in a month’s time if I return each piece after wearing promptly. The four dresses I received in October totaled up to $184.50. That is $89.50 more than my monthly subscription! Imagine the value if I had returned these pieces and received even more! Check out all our Gwynnie Bee reviews and the Women’s Clothing Subscription Box Directory! What do you think of Gwynnie Bee lately? How do subscribers rate Gwynnie Bee? Do you subscribe to Gwynnie Bee? Add your rating now!